This week I’ve packed up a 4,000 square foot office with my co-workers and downsized to a 1,000 square foot temporary space in a pilot’s lounge at the old Indianapolis airport. Out one window I see planes taking off. The other window looks over a jet in the hangar. Nothing feels like what I know. Tonight I came home wanting something that felt familiar and found heaps of fresh produce from Green B.E.A.N. Delivery. Regan and I forgot to swap out some of the unloved veggies in our standing order and so zucchini arrived as a surprise. Zucchini and I are not friends, unless it’s in bread. So tonight I decided to use Regan’s mom’s zucchini recipe to make a post-dinner treat. I love recipe cards and all the stories they contain. Vanilla stains the corners of some. Dried dough can be found on others. Drops of liquid have made the ink run on some, making a few of the recipes hard to read. Some recipes have handwritten notes in the margins. I especially love when I find recipes written in someone else’s pen. 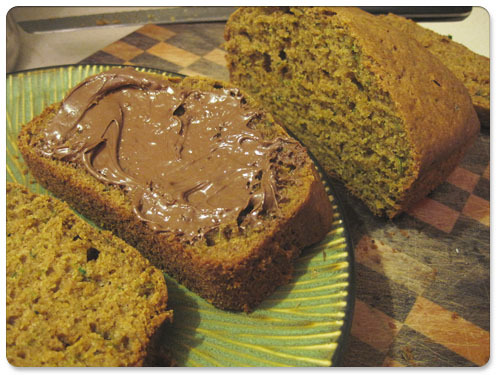 This zucchini bread recipe is written in Regan’s hand and is hard to discern. On one half of the paper notes about logging into his VPN are scribbled. There’s also a partial list of proof of identity he would have to bring with him in order to get our wedding certificate. With all the notes scribbled about, I can tell he was on the phone with his mom about 5 years ago and grabbed the first piece of paper handy before his mom started listing off ingredients of the zucchini bread he loved as a kid. And there’s a reason he loved it. It’s good as is, but it’s also the perfect Thursday evening treat when slathered with some Nutella. 1. Preheat oven 325 degrees fahrenheit and grease two 8×4 inch loaf pans. 3. In a separate bowl, mix flour, salt, baking soda, baking powder and cinnamon together, then sift into the wet mixture, mixing until well incorporated. 4. Stir in zucchini. Mix well until batter becomes moist and even. 5. Pour into prepared pans and bake in preheated oven for 55 minutes, or until toothpick stuck in center comes out cleanly. That minestrone soup I made had zucchini in it too! Now you have ONE more use for that crazy squash. Mmm. Minestrone soup. You are right — delicious! Fried, everything fried is good.